Verbal abuse over an extended period of time can leave marks on the heart and soul for a lifetime. Imagine what people would look like if the damage of verbal abuse left visible scars. Many of us would have much difficulty coming into public view. The spiritual and emotional impact of verbal abuse has led many of us down dark paths of pain and regret. 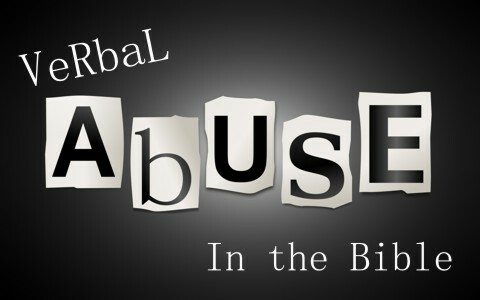 What does the Bible reveal about verbal abuse? “Not a word from their mouth can be trusted; their heart is filled with malice. Their throat is an open grave; with their tongues they tell lies” (Psalm 9:1). A verbal abuser doesn’t represent the truth that comes from God. Verbal abuse is different from constructive criticism as it destroys the spirit with lies instead of building up. We must be aware to always compare the truth of God’s word to what people say. “The words of their mouths are wicked and deceitful; they fail to act wisely or do good” (Psalm 36:3). Verbal abusers speak foolishly without wisdom that comes from God. Many of them are deceived into thinking that they are helping others when in fact they are tearing people down. Their lack of wisdom keeps them from doing good for others. “Keep your mouth free of perversity; keep corrupt talk far from your lips” (Proverbs 4:24). Satan uses the corruption of verbal abuse to distract believers from their God-given purpose. He plants the seed of verbal abuse into our hearts and minds if we aren’t sober and alert to God’s ways. Those who are verbally abusive are being used by the devil to accomplish his evil plans. “The mouth of the righteous is a fountain of life, but the mouth of the wicked conceals violence” (Proverbs 10:11). Most times those who are verbally abusive are also physically abusive to others as well. It’s difficult for them to contain the abuse to just words. The violence of verbal abuse can bring painful memories that will follow many people into old age and to the grave. “The mouths of fools are their undoing, and their lips are a snare to their very lives” (Proverbs 18:7). Verbal abuse has long lasting consequences on the abuser as well as those they abuse. God will punish the evil doers for their words on others. They will find themselves imprisoned by their own words which were meant to hurt people. The heart of a verbally abusive person reveals the condition of their heart. Just as a physically sick heart can bring a person down—a spiritually sick heart does as well. The defiled heart can’t help to reveal itself through abusive language. “Do not let any unwholesome talk come out of your mouths, but only what is helpful for building others up according to their needs, that it may benefit those who listen. And do not grieve the Holy Spirit of God, with whom you were sealed for the day of redemption” (Ephesians 4:29-30). All believers in Christ Jesus have the Holy Spirit. We need the Spirit of God to give us wisdom and direction in our time of need. However, if we grieve the Holy Spirit with our abusive language—there are consequences such as not being able to hear from God as we once did in the past. There is hope for the verbally abusive person. In true repentance and with a contrite heart, a verbal abuser can receive forgiveness and be cleansed from their wicked language. When the Lord changes the heart, there is the fruit of speaking more kindly, gently, and lovingly. The Lord through the Holy Spirit can also bring healing to those who’ve been verbally abused over long periods of time. He gives us the Bible to know and memorize scriptures which speak truth to our hearts and minds. Through God’s healing we become stronger in the faith and eventually verbally abusive words lose their power over us. Whether we are victims of verbal abuse or verbally abusive people—there is hope and healing when we surrender our cares to the Lord. He never speaks abusively to His children—the only language He speaks is love. Take a look at this related article: Can a Christian Be Angry and Not Sin? That was much needed! Thank you ! I need help to overcome a 39 year marriage of verbal buses. Its getting worse. I am disable and still have two grandchildren in the home. Lot of family issues. I stopped going to church because I felt I was not good enough because I could not make my full tithes. I am confused, always upset, don’t get help unless I have to ask from spouse.wouldn’t you think he would notice? Just need to hear some positive thoughts. Thanks for listening. Hello Mrs. Rice. I am so sorry for all this heartache. I know that verbal abuse is not grounds for divorce. I think it’s bad to stop going to church because we need each other as the days grow closer to Christ’s return (Heb 10:24-25) and Satan is like a roaring lion, and he loves to see those separated from the flock of love, prayers, and support. There are over 50 “one another’s” so if will only get worse if you cut yourself off from Jesus’ church. I fear your husband is not saved. He doesn’t sound like it (1 John chapter 3), so pray that this man trusts in Christ, because only God can change a human heart (Prove 21:1; Acts 16:14). I know that’s probably not what you wanted to hear, but it is what the Bible teaches, but I will surely pray for you to endure and for your husband to be saved. Here’s another thought, Annie. Taken from the CBN.com website and as an extension of 1 Corinthians 7:15 about an unbelieving spouse’s desertion providing grounds for divorce and remarriage: “And some people recognize such a thing as a ‘constructive desertion,’ which would be when a husband so brutalizes his wife that it is impossible to live with him any longer; or when a wife has so harassed, or brutalized her husband that it becomes impossible for him to stay with her. When that happens, whether or not the person actually moves out, the situation is the equivalent of desertion, and divorce and remarriage are permissible.” (CBN.com, “What Does the Bible Say About Divorce and Remarriage,” CBN. Still praying for you Annie. I know the Lord hears our prayers. verbally abused. Husband does not want me to work to support us and thinks we can live on canada pension ( 350.00) a month and stay home. I confess I have retaliated verbally. So much abuse over 40 years of marriage that I live in fear around him whenever he is around. Hard to please him all the time. I don’t want to lose our children or g. children. They haven’t got a clue how hard it is. Rise early to pray and instead receive verbal onslaught. No place to go for safety. Pray for me for wisdom. I dont talk anymore. No friends. I have hurt him too.